Mark: Hi, it's Mark Bossert here with the Pawlik Automotive Podcast. I'm the producer of our cast, our videos, our stuff. We do the websites. We do all kinds of stuff. We're here with Mr. Bernie Pawlik, Pawlik Automotive in Vancouver. How are you this morning, Bernie? Mark: Kind of got lost there for a minute. We're gonna talk about a 2002 Audi A6. What was going on with this fine German automobile? Bernie: This vehicle came to our shop. The owner was complaining of a loss of coolant. Not huge, but over time it was leaking coolant, so that was the client's complaint, coolant loss. Mark: What tests did you do to find a loss of coolant? Bernie: There's a couple ways we can test the cooling system. The way we generally ... Besides a visual inspection to verify a leak, which we can do under the car and on top, is a pressure test. What a pressure tester does, it actually puts the cooling system under pressure, same as what occurs when the engine actually warms up. The way a car cooling system works is it's a pressurized system. There's a sealed cap, which will blow off if the pressure exceeds a certain amount. Usually it's about 16 pounds per square inch, Psi. Some engines are a bit lower, some are a bit higher, but that's sort of the average. The pressure tester basically puts the ... We can put it under that level of pressure, and that'll force coolant out of the system. The thing with a coolant leak is, again, when the engine's cold, there's no pressure, so there may not be a leak. Sometimes there is a leak when there's no pressure, and then when it pressurizes, there's a leak. It's kind of odd the way cars work. Generally speaking, the more pressure you have, the easier the leak will occur. So we pressurize the system and then look for leaks. Sometimes it'll take a matter of seconds if it's a large leak. Other times, we've had vehicles where we pressurize it. An hour later, we look, can't see a leak. Leave the pressure tester on. Next morning, we come into the shop and there's drips on the floor and go, "Ah, that's where it is." Sometimes it's quick, sometimes it takes a while. There is one other test we do, and that is for combustion gas leakage if we suspect a cylinder head problem, but that wasn't the case in this vehicle. The only testing we did on this was a pressure test. Mark: And what did you find? Bernie: What we found was there was a leak under the intake manifold around the back of the engine, which required further disassembly. What we did eventually find was the auxiliary water pump, which is located underneath the intake manifold, was leaking. That was the major cause of our leak. With Audis, there's so many hidden bits and pieces. This is true of a lot of cars nowadays. 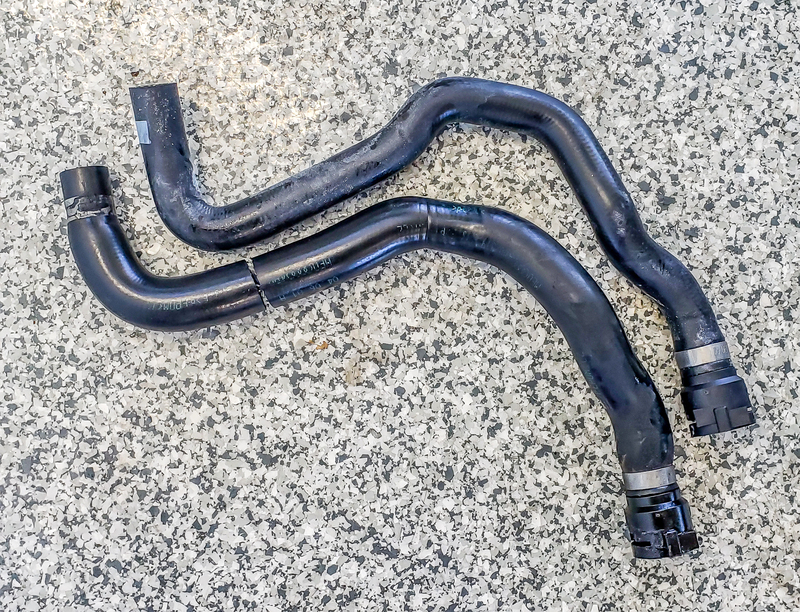 There's coolant pipes that run in various spots that are hidden under the intake manifold, under covers. There's a lot that often needs to be removed just to find a leak. But that's what we found on this car. Auxiliary water pump was leaking. Mark: What was involved with repairing these components? Bernie: A lot of disassembly. It's a lot of work. The other thing we did was replace the heater hoses as well. Let's just get into a bit of a picture show here. Mark Bossert: Go to the pictures. Bernie: Yes. The pictures. If you open the hood of this Audi A6, it's a V6 bi-turbo engine, which right away tells you there's a lot of stuff under the hood. There are two turbocharges hidden, one on each side buried way down, almost impossible to see. This is basically the engine cover, the air intake pipe on the top, covers over the battery, plastic covers around the ... There's a lot of covers. This is what we found once we removed the covers. The intake manifold, and that's the auxiliary water pump. This is located brilliantly, right in one of the hottest areas of the engine underneath the intake manifold. Obviously not a bad spot, because the car's a 2002 and it's 2018 right now, so that's a good 16 years of use and it's just started to leak. It possibly could be a better spot, but that's why it's there. The other item I mentioned we replaced were the heater hoses, and I'll show you a picture in a minute. The heater hoses run from this area here. They run beside the battery, underneath the firewall here, through a tube, and they terminate somewhere way under here that you can't even see. Again, just for perspective, this is with the cover on. This is with everything removed. You can see there's a lot that's changed. Now heater hoses. The heater hoses were not leaking, but we did this as a maintenance item. While we were working on the vehicle, we noted that the heater hoses were quite swollen. If you look, this is a brand new hose here, and this is the old hose here. Just take a minute to look at it. You can see where this clamp goes, how the rubber is much larger here. It's much larger in diameter here. By the way, that cut was just done for removal purposes. But you can see the whole hose itself is quite a lot larger. Wasn't leaking, but when a hose gets like this, the rubber's deteriorated really badly, and it's only a matter of time before it blows. Mark: It looks like a good bratwurst. Bernie: It does, exactly. Very good. Yeah, so anyhow, that's ... Yeah. That's our hose. Again, this is basically done as a preventative maintenance. Definitely extra labor to do it, but while we had the intake manifold off, made a lot of sense because it saved the client quite a few hours of labor, hence money. Mark: These are complex vehicles, Audis. We've talked a lot about Audis, and they always are complex, so that means it's expensive and somewhat complicated to repair. Is it still worth it at this age? Bernie: I think so. It largely depends on how the vehicle's maintained and who the owner is and how you take care of it. We've serviced this vehicle for quite a few years now. Previously, all the service they did on it was pretty up-to-date. When you keep a vehicle in good shape, it's just a matter of repairing the items as you go. Yes, they are expensive to repair. It's also an expensive car to replace. This particular model, the A6 with the 2.7 turbo was not a cheap model in its day. Again, calculating the cost of repairs, if you look at it over a period of a year and you think, "Well, say I spent $5,000 in a year." Most people think, "Oh, that's a lot of money." But you think a lease payment on a car like this, probably $1,000 a month. That puts you about $12,000 a year. Yes, you do have the benefit of a brand new car, but for about a third of the price, you can maintain an old one and take care of it. I think it's a good way to go. Either way with a car, it's money out the door whether you're making monthly payments, whether you're saving money and you buy the car cash, or whether you're repairing it and maintaining it. It's money out the door. You just gotta look and see how much it is. Mark: That's one way to amortize or look at your car repair costs then, I guess. Bernie: Yeah, exactly. I've had, interestingly, conversations with people where they ... "Oh, the car's worth $4,000. I don't wanna spend two on it 'cause that's half the value." I'm thinking, "What does that have to do with it?" It's really about looking at how much money's actually going out the door, 'cause no matter what you do, money is gonna have to go out the door. If you keep it in good shape and take care of it, it'll be better overall. I think it's important to just kinda calculate your overall costs. Of course if you buy a new car, which is fantastic to have, the insurance costs are higher on a newer car than an older one. I don't know. It's a matter of just crunching the numbers, looking at it, seeing if it works. Of course if your car's in the shop every month for a breakdown, that's not very good either. There comes a time and place where it's time to retire a car, but in the case of this Audi, the mileage is still fairly low. The owner takes pretty good care of it. They're able to part with it for a few days every once in a while to do some maintenance and repairs. Mark: Speaking of the Audi A6, how was it after the repairs? Bernie: Yeah, really awesome. No further coolant leaks. Again, with those heater hoses replaced, we prevented a further unexpected repair. We could've left those. But somewhere down the road those hoses are gonna burst, and it'll be driving down the highway or driving down the road somewhere where you're on your way to a meeting. This is what we like to do at our shop, is find those kind of things and prevent them from happening. That's the whole key to preventative maintenance is fixing it beforehand. And it's cheaper and less stressful. Mark: So there you go. If you need service for your fine German automobile in Vancouver, the guys to see are Pawlik Automotive. You can reach them at 604-327-7112 to book your appointment. You have to call and book ahead, 'cause they're busy. Or check out their website, PawlikAutomotive.com. We have hundreds of videos on YouTube. Check us out there. Or thank you so much for listening to the podcast, and thank you, Bernie.